Born on Eridanus II around the year 2510, John lived generally normal life up until the age of six, where his natural prowess as a leader and fighter gained the attention of Dr. Katherine Halsey, an ONI scientist.. Upon this discovery, Halsey, over a secret program codenamed the "Spartan II" project, took john in along with other children and trained him. Eventually, He would come along as humanities last and greatest hope. 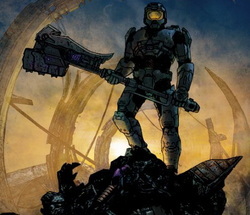 Thought to have died at the final battle of the war, Master Chief was a hero to what was left of humanity.